So great news – you’ve got a 3 week trip planned around the North Island of New Zealand and you’re setting off from Auckland. The first place to visit will be the Bay of Islands and although there’s heaps of stuff to do once you get up there, make sure you take the time on your drive north to stop off at some of the little gems along the way – it’s a great way to break up your journey but also discover some of the great things that are not always listed in the ‘things to do’ guides. So, without further ado – let’s GO! You could spend 21 days in and around Auckland alone there is so much to do but with only 21 days to explore all of the North Island, 1 day in NZ’s largest city, home to 1.3 million people and known as the City of Sails is all we can afford. After a nice stroll in downtown Auckland, checking out the Viaduct area and maybe grabbing a bite to eat it’s time to get to know your new hire car a little better. A perfect place to start is to head out west through the suburbs and out to the Waitakere Ranges. With heaps of tracks through the lush forest, there is plenty to keep you busy here. If walking’s not your thing, keep driving through the forest and end up at one of the superb west coast beaches like Piha or Muriwai. The surf’s good out there and the black volcanic sand makes for an interesting day at the beach. Auckland is an awesome place to spend the day and there is something for everyone. If you need some more inspiration, check out our top 5 things to do in Auckland. Whether you’ve just flown in or you live in and around Auckland, the drive North up State Highway 1 offers up some great stop off points on the way so take your time and make the most of some of these little unknown beauties. A trip to Northland wouldn’t be complete without a trip to the Northern most tip of New Zealand where you get to see the rare occurrence of 2 oceans colliding which can be spectacular on a stormy day. The Tasman Sea and the Pacific Ocean cross over at the tip of Cape Reinga and from the lighthouse, you get some fantastic views out over the spectacle. The drive north will take you up alongside 90 mile beach and it’s well worth a stop off on your way up or on your way back down. Officially a highway, 90 mile beach is only recommended for 4WD vehicles and unfortunately our GO cars are not insured to be driven on the sand. This doesn’t mean that you can’t still have lots of fun up here. From surfing the waves to riding the sand dunes, there are plenty of activities on both the land and sea to keep you entertained. It will have been a full day of driving but hopefully you have managed a lot of pit stops along the way and really soaked up the best that Northland has to offer. Arriving back in Paihia, there are plenty of options for eating and drinking – two GO Rentals favourites include Only Seafood and the Bay of Islands Swordfish Club who always have a warm welcome for visitors. After a full on day driving up to the Northern most tip of New Zealand, today is going to be a bit more relaxing with less driving and more sight-seeing. Located in Kerikeri, the Stone Store is New Zealand’s oldest building dating back to 1836. This is a chance to take a step back in time and from here you can also go on a tour of New Zealand’s oldest building, the wooden Mission House which dates back to 1822. There is a store that sells all sorts of Kiwiana gifts as well as the type of goods that used to be sold in the Stone Store. There are some short walks around the area including the historical walk which leads you on a trail of discovery back into Maori culture. A short drive out of Paihia and you come across Haruru Falls – a small residential settlement that sit alongside the waterfalls of the same name. Haruru literally means ‘big noise’ and the water coming over the falls after heavy rainfall can make a deafening sound. The waterfalls provide some great photo opportunities and if you don’t fancy a drive out today, you can always hop onto a boardwalked track that runs from the Waitangi Treaty Grounds to the falls. Of course this day is all about relaxing and with so much to do here in the Bay of Islands, this is also a great chance to explore anything you didn’t manage to fit into day 2 of your adventure. If you took a trip out on a boat to see the Hole in the Rock or maybe a jet boat ride, perhaps today is the day for catching the ferry over to Russell and taking it easy. Hopefully you will have crammed a lot into your 5 day trip to the Bay of Islands – there is so much to see and do up here that people always leave wishing they had more time. If you’re not in a hurry to get back to Auckland it’s well worth taking a longer route back to the big little city to check out the impressive Kauri trees in the Waipoua Forest. Although this is not an island, the easiest was to get to Devonport from the city is via a 15 minute ferry. As you disembark, you will find yourself taking a step back in terms of the pace of life over in Devonport. With a great variety of cafes and bars, it’s a great place to spend a few hours meandering around the headland or for the more energetic, take a walk up Mount Victoria, the highest volcano on the North Shore. You must have noticed the conical island located just off shore and visible from many places around Auckland? Rangitoto is the youngest of the 50 volcanoes dotted in and around Auckland and there are regular ferries running to the island every day. Once you get dropped off, there is a clearly marked path which allows you to walk all the way to the summit offering amazing views back to the city and on clear days, across to the Coromandel Peninsula and up to Goat Island. This is probably the favourite trip for the GO Rentals crew as there is so much to do on Waiheke. The island is extremely developed with all the amenities you would expect on the main land. The best thing about Waiheke however is the grapes and in particular, those used for making wine. There are a number of companies offering wine tours or you can hire a bike and cycle to the cellar doors – most offer sampling and it’s a great way to see the island. As well as some superb wine, the island also has some amazing beaches and we recommend spending a full day on the island. Heading out from central Auckland and taking the State Highway 1 south, you will soon find yourself getting away from the hustle and bustle of the big little city as you start to hit the lush green countryside. Just past Bombay is the turn off towards the Coromandel onto SH2 however we urge you to head down SH1 for one additional junction – the detour will be well worth it we promise! As you head out of the peninsula, make sure you stop by the impressive Martha’s Mine in Waihi. You can take a goldmine tour and find out more about this important part of New Zealand history. Take some time to learn a bit more about the gold mining history, as there won’t be many other opportunities to do so during the trip. To get to the start of the walkway, park your rental car at the Karangahake Domain Car Park on SH2 between Waihi and Paeroa, get your hiking boots on and off you go! With plenty of accommodation options from B&Bs to lodges, Paeroa is a great place to stop off for the night on your route south. Matamata – so good they named it twice! If you’re a Lord of the Rings fan, this is the place for you. If you’re not a Lord of the Rings fan (we don’t judge), you’ll still enjoy the stop in Matamata. The town includes the set of Hobbiton from Peter Jackson’s movies and a guided tour of the movie set (starting from the Information Centre right on the main street) is a must-do for any visitor. 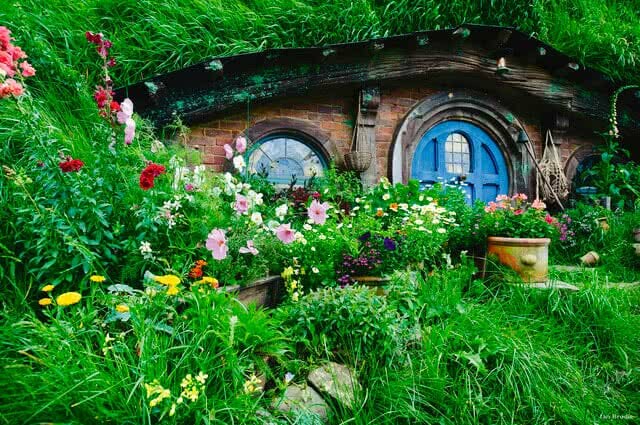 You’ll be able to visit 44 unique hobbit holes (just like in the movies), including Bag End (Bilbo Baggins’ house), as you make your way through the Shire, passing iconic locations such as the Green Dragon Pub, the double arched bridge and the Party Tree. Another great photo op awaits so show us your best Frodo pose or maybe you’re more of a Legolas! After that, it’s time to continue south. Our next stop: Putaruru. Not exactly the most obvious choice for a recommended touristic attraction but we’re talking about unique and quaint experiences that you will only get in New Zealand, right? So here’s one: a chainsaw collection at a Timber Museum in the small town of Putaruru, about an hour south of Hamilton. You don’t find that in many other places. Before you head out of Putaruru, stop for a visit to the international acclaimed Blue Spring with crystal clear blue waters. Pack a picnic and head along the Te Waihou Walkway to reach the spring. The walk takes about 1.5 hours each way and passes through rolling farmland, New Zealand native bush and even some waterfalls. Mandatory waterfall photo taken, it’s time to keep heading south. Our next stop is Rotorua and should take you about 50 minutes. You probably noticed it as soon as you drove into Rotorua – that sulphuric smell (no that wasn’t your fellow passengers! ), the vents on the ground letting steam off, the boiling mud everywhere. You’ve arrived in New Zealand’s thermal wonderland. Rotorua is bubbling (see what we did there?) with geothermal activity and you can see it (and smell it) wherever you look. But one of the best places to see it in all its glory is Wai-O-Tapu, a place that encompasses a range of different volcanic activity, including the world famous Champagne Pool and the Lady Knox Geyser. You’ll want to spend a good couple of hours wandering around Wai-O-Tapu and visiting all the different lakes, mud pools and geysers. And…Wai-O-Tapu is a GO Play partner so you get all this geothermal fun with a 10% discount. Result. For stunning examples of Maori culture that you’ll not find anywhere else, pay a visit to Te Puia (about five minutes from the centre of town). You’ll learn about Maori culture and costumes from Maori people themselves, as well as witness a few more examples of geothermal activity (we’re still in Rotorua after all). Make sure you attend the Maori culture performance at the Marae (by the entrance) and visit the New Zealand Maori Arts and Crafts Institute located inside as well. Te Puia also includes a live kiwi bird enclosure (a rare opportunity to see the New Zealand icon) and the famous Pohutu Geyser. Right, that’s enough walking around, it’s time for some adrenaline. Head to the Zorb (149 Western Road in Rotorua), another GO Play partner, for a few minutes of adrenaline-infused adventure. Zorbing first started in New Zealand so what better place to experience it than right in the heart of the country where it all began? Zorbing (which is basically rolling down some hills inside a giant inflatable ball) is one of those activities on many people’s bucket lists. Tick that off yours now before we continue heading south. Our next stop is Mamaku Blue (311 Maraeroa Rd) for a more relaxed, less adrenaline-infused activity. This is where you’ll find out that, in case you didn’t know, blueberries are the solution to all your problems. At Mamaku Blue, everything is blueberry-based, from the wine to the toiletries. Did you even know you could get blueberry wine? The cafe only serves blueberry-based food and you’ll have the chance to learn all about how this fruit can heal pretty much anything. The New Zealand Caterpillar Experience will be another one of those unique places you probably don’t expect to find anywhere. Located on 171 Fairy Springs Road, this is the work of Lindsay Willis, a man who has been collecting Caterpillar equipment for most of his life. We’re talking heavy machinery here, no small stuff. This is the world’s foremost collection of this sort of equipment and Willis keeps it all in excellent condition (with some of the oldest ones still in working order). The displays are set alongside footage of some of the machinery at work, way back in the day, and you’ll get to see some trucks and bulldozers that are now the only examples left of their kind. Impressive stuff! It’s been an exciting few days and we’re not even close to done yet. It’s time to relax. Before you head out of Rotorua, we suggest you take a few hours to visit the Polynesian Spa, voted one of the best spas in the world. Choose from a range of hot pools or book a massage and enjoy a couple of hours of what holidays really are about – doing absolutely nothing. 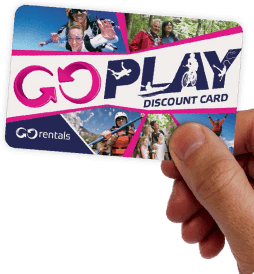 Rotorua really is the town that keeps on giving with lots more GO Play partners based in and around this geothermal wonderland. We have only given you a flavour of the things you can do here but you may decide you fancy something a bit different so go knock yourselves out and have some fun! Our journey south continues through to Taupo, a town on the shore of New Zealand’s largest lake (with the same name). There’s no shortage of things to do and you can pick and choose from a range of activities. Make sure you stop at the Huka Falls, a set of incredibly impressive waterfalls along the Waikato River, with about 220,000 litres of water flowing per second (that’s a lot of water). Next, stop at the Huka Prawn Park (Karetoto Rd) for a visit (you’ll need a couple of hours if you want to take the tour) and some seafood deliciousness. Lake Taupo itself is pretty impressive and, not far from the township, along the Desert Road, you’ll get to see Mount Ruapehu (Mount Doom for you Lord of the Rings fans) and its neighbouring (and equally impressive) volcanoes. The Desert Road itself is worth the drive as the scenery is not something you’ll find anywhere else (alpine deserts such as this one are a rare sight anywhere else in the world) so take your time to soak in the views. Although this is a guide to off-the-beaten track adventures it would seem wrong if we failed to mention the amazing skydiving to be had over Lake Taupo. The views are simply stunning as you plummet from 13,000 feet heading towards the lake. A further bonus is that Taupo Tandem Skydiving is a GO Play partner and will kindly offer you a 5% discount for the pleasure of throwing yourself out of a perfectly good aeroplane! After a full day relaxing, it’s time to get your skates on and head on over east side to Napier – the wine growing heart of the North Island and a place where sunshine is usually the order of the day. From Taupo take the SH5 heading east and follow the signs for Napier. It’s a lovely drive down with plenty of little villages along the way if you want a taste of kiwiana or just a stretch of the legs – the main event of the day awaits in Napier though. With so many things to do in Napier, hopefully you’ll have arrived in good time to cram it all into one day (and the next morning – shhh!). Napier feels like a step back in time (even more so than the rest of NZ!) with its art deco facades and fountains so take your own step back, slow it all down and spend the day doing exactly what you want to do – you’ve deserved it. It is possible to make the drive to New Plymouth in one go, however that is a monster day of driving and with so many things to see and do on the way, we would definitely recommend a stopover in Whanganui on the way north. We bet you’re glad you decided on a stopover in Whanganui now! With only 2 hours of driving ahead of you again today, you can relax and stop off at places of interest along the way some of which are little pieces of New Zealand gold dust! So, the final day of this road trip has arrived but what a beautiful place to wake up in. Raglan is a great place to explore first thing in the morning and is often a hive of activity with surfers heading out to catch a wave and morning joggers and walkers out to enjoy the magnificent views. We have left you with a relatively short drive back to Auckland today so depending on what time your car is due back, you should have time to grab an expresso from one of the local cafes and enjoy the final morning of your holiday. We hope you have had an amazing time and seen some pretty cool things along the way. Be sure to send in your photos for our GO Snap Happy competition or to our GO Explore Facebook page – we would love to use them on our itineraries to show off to other travellers.